We know that Zombie Lab takes place in Hong Kong - the titular lab itself is "at the center of Hong Kong Island," which seems like it would be in the Wan Chai District (which is in the middle of the island), but it's possible they meant "Central" (the main urban area), which is actually part of the Central and Western District. It could really be either. Geographically, the middle of the island would be somewhere around Wong Nai Chung Gap, but that seems more rural than the story suggests. Of course, it also says the government set up a five-kilometer blockade around the outbreak, but Hong Kong Island isn't even 5km across at its narrowest point, so wherever it is, they'd have to be blockading part of the bay. The "Tower 101" that's so prominent in Chapter 3 doesn't seem to be a real location, but it's possible that it's at least inspired by Central Plaza or 2 IFC. Hong Kong is an international economic powerhouse, so it's not unreasonable that a blond white guy would be a banker there. 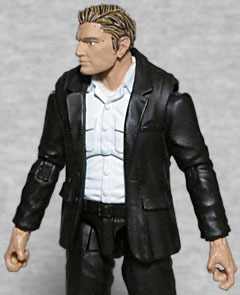 The head is the same one used on Jack Lee and Weapons Expert Ethan, meaning that of the four male characters released so far, three of them all share a single mold, with the only differences coming thanks to the paint. Not that changing paint is a bad thing. Consider the body, for instance: Mr. Bane is wearing a black business suit with a white shirt, a perfectly cromulent thing for a banker to be wearing. Sure, it's not like "a banker" is the same thing as being "a bank teller," and he would thus almost never interact with the public and therefore has literally no need to dress like this, but conservative fashion mandates are deeply rooted and hard to get away from, no matter how pointless and outdated they are. Ler office workers dress like normal human beings, you cowards! Anyway, the point is, every mold below the neck of this figure is the same used for Dr. Banner, but the paint makes it look completely different. Zombie Lab licensed the Vitruvian HACKS design for their toys, so the figures move with swivel/hinge ankles; double-hinge knees; balljointed hips; a balljointed torso; swivel/hinge shoulders, elbows and wrists; and a balljointed head and neck. The right elbow on my figure broke as soon as I tried to move it, but a quick email to Locker Toys Group and a replacement arm was on its way to me! Good thing these toys are modular, and that the company cares about their quality. 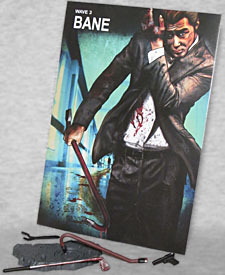 Considering that Chapter 3 the Zombie Lab story specifically names a weapon Bane uses - a baseball bat - it's weird that the toy doesn't include one. 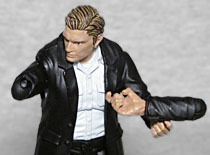 He's got a pistol, a bloody golf club, a crowbar as big as his torso... but no bat. Maybe he lent it to Zoe? There's also the usual display base, and the art card with the story printed on the back. 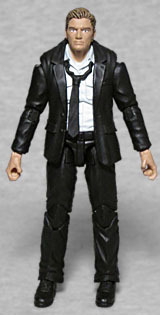 He does also include the loosened necktie piece seen on Zombie 001, to complete his businessman look. We couldn't tell you why Zombie Lab chose the name "Bane" for its banker, though the combination does have its connotations. Still, this Bane seems like a good guy, and Locker Toys being willing to take care of a broken figure shows that they're good toymakers.